“ROCOCÒ GARDEN PIC NIC IN VILLA” - SEPTEMBER EDITION PRO RIVIERA DEL BRENTA Dressed Picnic in characteristic clothing of the 1700. The event is in favor of the Riviera del Brenta, an area damaged by a tornado during the summer. During Expo2015, Antico Atelier invites you to the wonderful Villa Widmann in Mira, dressed in typical clothing of the eighteenth-century, to experience a Rococò picnic. In the occasion of Expo 2015, dedicated to food, prepare your picnic basket, full of delicacies typical of your region; bring with you pillows and blanket and come to live a full day plunged in the 1700 period. A unique experience, in the amazing garden of Villa Widmann, rich in history, frescos and full of meanings to discover. Maître Animateur Royale: Maurice Agosti Montenaro, Prince of Sansevero and Durazzo, that will celebrate with us, involving us in typical games and activities of the eighteenth-century, blind mans’ buff, agility competitions and bucolic dances. - REFINED MARKET OF WINE AND FOOD: let’s discover typical and local products in a market curated by the ProLoco of Mira (a local association with the aim of promoting events and products). The Garden will welcome ladies, enveloped by precious silk and refined laces, and charming gentlemen in their suit jacket, playing a old style seduction-game, among plumes, fans and perfumed face-powder. Relive with us the fascinating times of the Serenissima, in a court’s feast in one of the most beautiful and renowned historic villas. A rendezvous among lovers of the eighteenth-century, a moment to discuss about typical and regional food and about history of villas in the Veneto Region. We are really interested about the situation of the Riviera del Brenta, close to our Atelier; this is the reason why we have chosen a villa of the Riviera for the September edition. We want to transform our frivolous day into a real help for the Riviera del Brenta, damaged by a tornado during the evening of July, 8th 2015. For this reason, there will be a little house, for those who want to contribute with a donation during the entire day. Thanks from the deep of our heart! Tickets can be purchased in the administrative office of the villa. Parking area inside the villa. 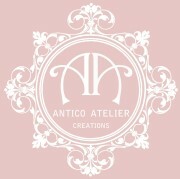 Antico Atelier is the brand of the refined creation by Francesca Serafini for the show business. Antico Atelier is the central store for Veneto, Italy and Europe, for the creation and production of dresses and accessories for cinemas, theaters and advertising. Creations completely hand-worked in the Veneto Region; polished raw material and refined quality, as the tradition of an Italian atelier wants. Antico Atelier comes from the passion of Francesca Serafini for the world of Cinema: where magic and dreams take shape, where the impossible is possible. Since many years Francesca welcomes customers in her Atelier, making them live the magic of a timeless athmosphere. Each dress or accessory is designed and made by the skilled hands of tireless Francesca; each customer becomes then a friend, he or she will be meticulously attendend by the staff, during the realization of their dream, in a continuous improvement and exchange of ideas and emotions, that will be then materialized in our creations. "My world outside of time has become my job with passion and commitment that I carry, and every time I have the privilege to carry out the wishes of other dreamers like me"
Thanks to all of my customers-friends who continue to dream with me!